From Siddharth to Sakyamuni and finally to the Buddha or the Enlightened one - an incredible transformation of prince to an enlightened teacher , who walked the earth more than 2500 years ago. This tour will take you to the most important places to give you insight into the 800 years old Buddhist religion as well as the world's best monuments of great history and art. On arrival meet & assist at the International Airport. Transfer to Hotel. Overnight stay at Hotel. Transfer to airport to depart for Patna. Upon arrival transfer from airport to hotel. Dinner and overnight stay at Hotel. Morning after breakfast drive down to Bodhgaya. Enroute Japanese lunch in Rajgir at Hotel Hokke via Nalanda Univesity ruins. Nalanda today in ruins; is the famous site as an ancient seat of learning of yester years. Founded in the 5th Century AD, this great seat of learning flourished until the 12th Century. Both the founders of the two religions Buddhism and Jainism, the Buddha and Parsvanath Mahavir, visited Nalanda. The Chinese chronicler Huien Tsang spent many years here both as a student and as a teacher. Rajgir is 12 kms south of Nalanda on the road to Bodhgaya and is located in a verdant valley surrounded by rocky hills. It is sacred to the memory of founders of both Buddhism and Jainism. Lord Buddha spent many months of retreat during the rainy season here and used to meditate and preach on the Griddhankuta, the hill of the Vultures. An aerial ropeway provides the link with a hilltop stupa built by the Japanese. One of the hills is the cave of Saptparni, where the first Buddhist Council was held. The Saptparni cave is also the source of the Rajgir hot water springs that have curative properties and are sacred to Hindus. Dinner and overnight in Bodhgaya. 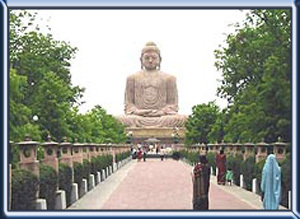 Full day sightseeing of Bodhgaya. Here under the Bodhi tree( Tree of Awakening ). Shakyamuni Gautam attained supreme knowledge to become Buddha, the "Enlightened One", the profounder of one of the great religions of the world. The tree that stands today is believed to have grown from the original Papal tree under which Lord Buddha meditated. River Niranjana in which the Buddha bathed after attaining enlightenment flows quietly outside the tiny hamlet where the story of Prince Siddhartha ended and the saga of the Buddha began. Overnight stay at Hotel. Morning after breakfast proceed to Varanasi. Upon arrival check in at hotel. Afternoon visit to Sarnath - the holy shrine of the Buddhist where LORD BUDHA preached his first sermon after he had gained Enlightenment. Overnight at hotel. Early morning sunrise Ghat tour. Breakfast at hotel. Some free time for souvenir shopping. After lunch departure transfer to airport to leave for Delhi. Upon arrival at Delhi, transfer from airport to Hotel. Dinner and overnight stay at hotel. After breakfast half day city tour of Old Delhi visiting Raj Ghat - The Mausoleum of Mahatma Gandhi. Jama Masjid - the biggest Mosque in India, drive past Red Fort and tricycle tour of Chandini Chowk. After lunch half day city tour of New Delhi. Drive past President House, Parliament House (House of Representatives) and India Gate - War Memorial (stop for photography), Qutab Minar - 72.55 meters, high Victory Tower, onto Bahai Temple (lotus temple) Humayun's Tomb- built of red sandstone and is a first substantial example of the Mughal architecture, Laxmi Narayan Temple - a modern Hindu temple built by the Birlas, leading Indian industrialist. After wards transfer to the International Airport to fly back home.